Some guys are there to make a good show. That’s the role they are chosen for and expected to play matched with established names or rising stars with their eyes on bigger things. Heading into December 22nd, the most anticipated fight at Jr. middleweight already felt penciled in. Sometime in 2019, WBC 154 lb. titlist Jermell Charlo would square off with unified WBA/IBF titlist Jarrett Hurd. All Charlo had to do was beat the guy who was supposed to lose. Slated as a co-feature for the fresh launch of the PBC on Fox series, as they moved from time buy to product purchased, this was supposed to be the beak wetter for the national audience. Detroit’s Tony Harrison has never been a pushover but previous adversity didn’t suggest he could defy the odds. 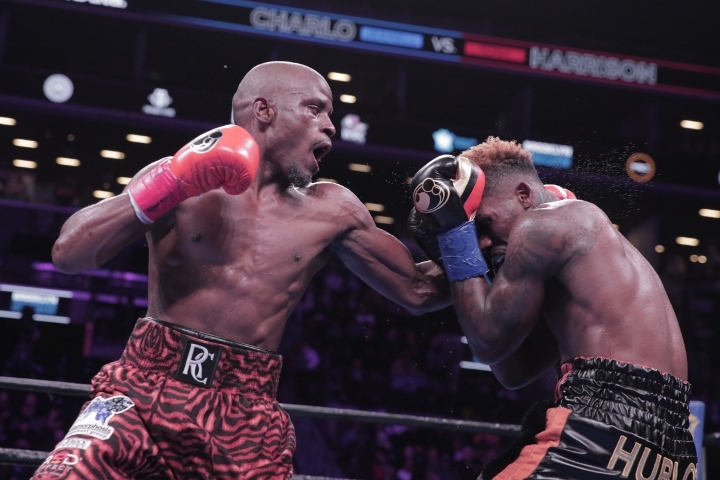 Stoppage losses to Hurd and Willie Nelson suggested a fighter who faded late and lacked the whiskers to hold off one half of the talented Texas Charlo twins for twelve rounds. Tony Harrison might have been expected to lose but he showed up with the game plan and conditioning to defy expectations. While there has been plenty of debate about the outcome, Harrison did just that in the BoxingScene Upset of the Year. Charlo connected with a hard right hand to the side of Harrison’s head when there was about 50 seconds to go in the first round. Harrison had difficulty letting his hands go during those first three minutes. Harrison hit Charlo with a straight right hand shortly after the midway point of the second round, his first clean shot of the fight. Harrison also worked well off his jab toward the end of the second round. Charlo hit Harrison with a left to the body and a straight right hand up top early in the third round. Harrison landed a short right hand inside late in the third round, soon after Charlo missed with a combination as Harrison backed toward the ropes. Harrison hit Charlo with a right hand, a left to the body and a hard jab later in the fourth. A left hook by Harrison caught Charlo on the side of his head toward the end of the fourth as well. Harrison snapped back Charlo’s head with a jarring jab about 40 seconds into the fourth round. Charlo came back a little less than a minute later with a hard right hand to the side of Harrison’s head. Charlo drilled Harrison with a right hand early in the fifth round, but Harrison fired back with a right hand that knocked Charlo off balance briefly. Charlo shook his head at Harrison, who couldn’t follow up. Later in the fifth, Charlo rocked Harrison with a right hand to the top of his head. Within the first minute of the sixth round, Charlo drilled Harrison with a right hand and then a left hook. Harrison landed a jab and a left hook in the final minute the sixth. Harrison pawed at his right eye after Charlo drilled him with a jab early in the seventh round. Harrison landed a left-right-left combination as Charlo came forward in the final minute of the seventh. Harrison hit Charlo with a three-punch combination as they stood in the center of the ring at about the one-minute mark of the ninth round. Charlo clocked Harrison with a right hand to the side of his head a little later in the ninth. Harrison’s straight right hand and short left uppercut connected early in the 10th round. Charlo continued pressuring him for the rest of the 10th round, but couldn’t connect with a shot to hurt Harrison. Harrison worked well off his jab for much of the 11th round, but Charlo caught him with a short, left uppercut from the inside during the final minute of that round. Charlo appeared to hurt Harrison with a left hook up top early in the 12th round. Harrison moved and held his way to the final bell, but did enough to convince the three judges thathe won. Take away what one will from the outcome. Maybe Charlo deserved the win but he left room for doubt in a contest where landed punches were at a premium. For now, Hurd-Charlo is a step farther away and Harrison will in the gym trying to make 2019 the year he perhaps gets a second crack at Hurd before Charlo gets a first. When the roads to showdowns are stretched out in favor of the build, strange things can happen. Strange things like the opponent expected to lose exiting a champion. In what felt like the blink of an eye, Ghana’s Isaac Dogboe went from largely unknown Jr. featherweight to fresh cult favorite. Heading into his second title defense against Navarrete in December, he was 3-0 for the year and had excited at each turn. His off the floor win against Jesse Magdaleno for the WBO title and first round stoppage of Hidenori Otake were already setting off whispers about fights down the road against men like Naoya Inoue. Then came Navarrete, a fighter who had lingered off Broadway, entering as an underdog. Dogboe never knew what hit him. Navarrete imposed his height, reach, and strength on Dogboe to earn a unanimous decision that looked more one sided than the scores. In what felt like another blink of an eye, 122 lbs. had a new titlist and new narrative to follow in the year ahead. Hekkie Budler had a nice reign at 105 lbs. but fell short in a crack at Milan Melindo for a 108 lb. belt in 2017 and looked up against it on the road in Japan in May. Ryoichi Taguchi dominated Melindo to unify the IBF and WBA belts and hadn’t lost since being the first man to take Naoya Inoue the distance in 2013. Budler fought his heart out and survived a knockdown in the final round to win a narrow unanimous decision…Sergey Kovalev was officially a round away from a Hall of Fame lock. Just one more winning round on the judges cards and he beats Andre Ward in their first fight. He didn’t get it, was stopped in the return, and left to rebuild. After two knockout wins that saw him regain an alphabet strap, he was off to a good start in August against veteran contender Eleider Alvarez. Kovalev looked back to form. Then Alvarez landed a bomb in the seventh round in August and Kovalev was unraveled in three devastating knockdowns…Ryoto Murata looked like he was headed to a showdown with Gennady Golovkin. The secondary WBA middleweight titlist and Olympic Gold medalist entered the ring with what should have been an undefeated mark in October to face once beaten Rob Brant in what felt like a formality. Instead, Brant beat him silly, barely losing a round in a career making upset. Khabib’s Explosion: Was it Unexpected and Justified?